A LOT can happen in the nine months between the end of one outdoor track season and the start of the next. When it comes to predicting performances in the spring, we have one important extra piece of data for looking at distance runners: cross country times. There is no equivalent for that information among power athletes, which makes it much harder to identify rising stars in those events. Thankfully, we have a wealth of data at our fingertips to help us spot the 3200, 1600, and even 800 runners that are most likely to emerge as powers between now and June. We compiled a decade of data on top cross country runners (in both the 5K and the 3 Mile), and then looked through the lists to get a sense of the 3200 and 1600 times we should expect from runners of that level. We also included the 800 in our data, although it is much harder to draw the parallel between fall success and 800 potential - some 800 stars don't post great cross country marks, and many top 5K or 3 Mile runners lack the pure speed to blaze a big 800. Still, if you look through the data with a critical eye, you can spot current runners whose track times lag noticeably behind those of past stars that ran the same cross country times. Since aerobic capacity does factor into all three distance races on the track, it simply stands to reason that significant improvement in the fall can lead to big jumps in the spring. One thing that's very important to recognize before we dive deep into the data: the state already has several established stars that won't appear in an article on potential breakthroughs. Athletes like Liam Anderson, Kristin Fahy, and Jacqueline Duarte will certainly set the standard for everyone else this spring, but they have already made the leap into state-wide and national recognition on the track. We're hunting for athletes that may have earned notice during cross country, but have big improvements ahead of them on the track. We've already seen a few candidates for the role of Breakout Distance Star of the Spring. 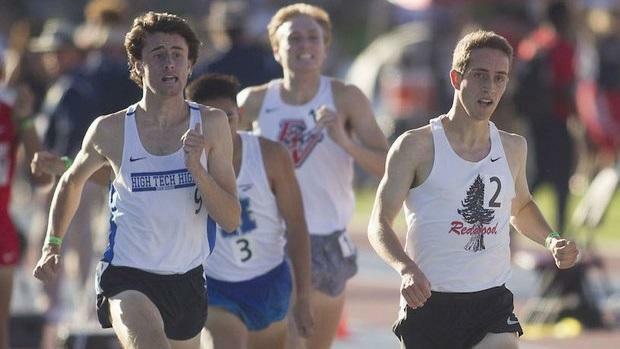 Let's take the case of Peter Herold, the JSerra senior who currently leads the state rankings in the 3200 (and also ranks 3rd in the 1600 and 2nd in the 800 this young season). Last spring, he ran 9:17, 4:17, and 1:57, which all came on the heels of a fall campaign that saw him post a PR of 14:40 for 3 Miles. Those times are quite comparable to what we have seen historically, and so his cross country time was a solid indicator of his track potential. Throughout the article, I will highlight several others who meet the profile for a runner that should be able to put up faster track times, based on their best cross country marks. Undoubtedly, though, there are many more emerging distance stars who have not begun racing, or have been training through early competitions and using them for workouts, thus not tipping us off yet to their true fitness. Most of the runners we will look at are well-known from their cross country exploits, and a few are already highly accomplished on the track - which indicates they may be ready to move into national stardom over the next few months. A small handful of these candidates may even be off your current radar. Flip through the slides to see who we think will join the ranks of the state-wide elite this spring!